For those looking for somewhere to connect with higher energies, Song of the River Retreat Sanctuary is the perfect place to unwind and experience the many meditation practices available. On a warm day, reclining against the River Clywedog which runs through the garden, there is a sense of profound stillness; on a clear night, gazing upward, millions of bright stars, you will feel the energies all around you. It is a truly remarkable place and they treat it here with utmost respect. By meditating here at Song of the River you will have the most amazing memorable experience. You will be accommodated in a stunning 4 bedroom bungalow in its own grounds, they have the Golden Room with access next to a stunning tiled bathroom and large shower. If one person is booking they automatically close the extra spare bedroom (Green Room). However if you are coming with a friend / relative thus booking 2 people, you can open the Green Room and you can both share the bathroom. Complimentary Wi-Fi internet access is available. When you arrive at 10.00 a.m. you will be met and greeted with refreshments and a discovery consultation. There will be sessions for you in the morning, lunch at 1 p.m. At 2 p.m. sessions again depending on your needs, you may wish to have some quiet time or getting in touch with nature with some beautiful walks. Evening meal is at 7.00 p.m., and after you will have the evening for whatever you feel comfortable with, maybe talks, discussions and relaxation. Breakfast is at at 9 a.m. The second day will be the same schedule as the day before apart from different sessions, if you so wish. Meditations are known to reduce stress, control anxiety and promote emotional health. Many people enhance their self awareness with Meditation practices and you will find that with specific energy tools, which we use, you will probably feel heightened bringing you into an amazing space, allowing peace and harmony to engulf your very being. Meditation can also help with age related memory loss, generate kindness and lengthen attention span, also helping enhance positive feelings towards yourself and others. It is known to also help with addictions and dependencies by increasing your self control. When you look into the many more benefits of meditation, it can improve sleep and also help control pain by reducing strain on the heart and decrease your blood pressure. Quartz is a noble, natural material that possesses an immense vibratory capacity. Eight crystal tubes of the crystal harp are tuned precisely on the C major key scale (432HZ) for perfect sound. The crystal harp produces powerful, resonant sounds which are multi-directional and multidimensional. You can play the crystal harp flat on a table, upright on its stand or hold it with one hand. The crystal harp can be used in its acoustic quality as a musical instrument, for therapy and meditation. The two instruments complement crystal sound instruments in a perfect way and intensified their sound, a wonderful therapy for the 21st century. Barbara provides the Crystal harp sound therapy for those in need, so relax, sit back, close your eyes and experience inner peace, love and harmony. For 3,000 years, statues of the Pharaohs depicted the healing rods by holding them in their hands. High priests and pharaohs were the only ones allowed to touch and use what you now know as healing devices. When the dynasties ended, the knowledge, the purpose, and use of the rods was known only to a few secret mystical societies who kept their existence hidden, until a European Russian scientist rediscovered them in a museum about 45 years ago. He was allowed to copy them in strict accordance to the original specifications. By holding the Egyptian healing rods for approximately 15 to 20 minutes, the Copper rod in your right hand (sun energy) and the Zinc rod in your left hand (moon energy), they may help with reducing stress, fatigue, improve vitality, balance the meridians, deepen meditation and expand physical abilities. Rods Quartz, Rods Kont, Rods Crystal, Rods Star, Rods Connectivity, Rods Consciousness and the latest new rods, the Amber Rods are all available for sessions here at Song of the River Sanctuary, a wonderful compliment to any other therapies and meditation practices. The pyramidal shape acts as a beacon, a transceiver for energy. The geometric structure amplifies the energy creating a vortex within the pyramid. This is where the energy will be utilised and directed. Structure and materials of pyramids can be made of many types of materials example cardboard, copper, stone, and can have a different number of sides example 3, 4, 6. Using good energy conductors, such as copper, seems to help the energy flow. They do not need to have a solid structure.This design is based on an Octahedron which is made up of two four sided pyramids, one inverted and placed beneath the other. The top section relates to the male aspects and the bottom section to the female aspects. When someone enters the pyramid it constantly tries to keep its own energy field in balance and in doing so, can sometimes help to balance and release blockages in their subtle energy fields (auras and chakras). Barbara qualified as a beauty and holistic therapist 20 years ago and have since that time had a great following for the Ancient Egyptians, their culture, their wonderful buildings and statues. She soon got involved with designing her treatment rooms with an Egyptian theme. Egyptian energy healing was something else she had researched and had a calling to look into some healing tools which she has been using for some years now. These wonderful sacred energy tools can help people overcome so many issues like stress, fatigue, insomnia and also advancing their spiritual path. The retreat will take place in Wrexham, Wales, UK at Song of the River Retreat Sanctuary. For those looking for some. The retreat is based in a beautiful private and secluded countryside setting on the River Clywedog nature trail. A quiet tranquil place which offers stunning views and country walks. The place is cosy and warm in winter and cool and airy in the summer.where to connect with higher energies then this is the perfect place to unwind and experience the many meditation practices available. All the food is cooked fresh and Barbara and Nick cater for special dietary needs if required. Bulgarian rose oil, or Rose Otto, is the essential oil extracted from the petals of one of the rarest flowers in the world, the Bulgarian Rose Damascena, which is only cultivated and harvested in the Rose Valley of Kazanlak (also known as the “Bulgarian Rose Valley”) each year between May and June. Due to its amazing properties, multiple applications in skin care, medicine, aromatherapy, and fine perfumery, pure genuine Bulgarian Rose Otto is considered one of the most precious essential oils in the world. Step 3 - A scalp neck and facial massage to enhance the deeply relaxing experience. Thermal basalt volcanic hot stones used in massage, may ease away stress and tension, aches and pains, helping to promote a deeply relaxing experience. Basalt stones are believed to be therapeutic and have wonderful healing energy. They are commonly used in massage therapy for relaxation and healing benefits. 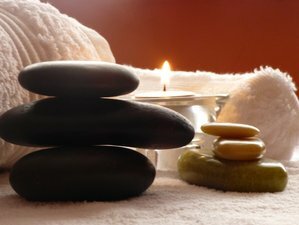 Specifically, basalt stones are used for hot stones massage because of the magnetic iron which holds heat. Basalt stones are present during volcanic eruptions and most are found mainly in coastal areas. Moreover, they contain a certain proportion of oxygen and silica as a combined element. When used in therapeutic massage they are shaped especially for their smoothness and healing properties. It does revive and relive the body muscles and tissues and is perfect for relaxation of body and mind. When you are stressed and tensed because of your daily cares in life, the heat from the basalt stones will help your muscles relax. When your muscles are relaxed, the thermal stones can penetrate deeper to help you release your tension. The pressure applied can rejuvenate tight muscles. Besides, the heat from the basalt stones has a calming effect on body muscles. Basalt stones are the natural carrier of magnetic iron and are able to hold heat for a certain period of time. For these reasons, when it is placed in the certain parts of the body, it is believed to improve blood and lymph circulation. The heat and the pressure from massage, promote healthy circulation of blood and lymph. The flourishing circulation can release you from fatigue and stress. The hot basalt stones associated with the pressure of massage will relieve your pain from arthritis, stiff joints, and others. The penetrating heat can provide a greater relief and calming effect on the body. When suffering from body pain, hot stone massage from basalt stones will re-energise your body. Known to the Chinese as the stone of heaven, jade has always been a prized gemstone in many parts of the world. It has been used by the African Egyptians and Mayans as a massage and meditation tool for over 7000 years. Jade is considered the health, wealth and longevity stone. Jade has the composition of iron, magnesium & calcium, Jade is the only massage stone that can hold both heat and cold equally well. Relaxation of the mind achieved from the intense nature of massage with the help of penetrating heat from the basalt stone. When the mind is relaxed, mental stress and tension have no room in your thinking. No thoughts of deadline, cares of life and anxiety. The heated stones that are positioned in the pressure points of the body together with the pressure of the massage are capable to put your mind at ease. When mind is calm and relaxed, you can achieved what they called the deep meditative state. Shungite is a black, lustrous, non-crystalline mineraloid consisting of more than 98 weight percent of carbon. It was first described from a deposit near Shunga village, in Karelia, Russia, from where it gets its name. Shungite has been reported to contain trace amounts of fullerenes. Shungite has been used as a folk medical treatment since the early 18th century. Peter the Great set up Russia’s first spa in Karelia to make use of the water purifying properties of Shungite, which he had himself experienced. He also instigated its use in providing purified water for the Russian army. The anti-bacterial properties of Shungite have been confirmed by modern testing. Shungite has been used since the middle of the 18th century as a pigment for paint and is currently sold under the names carbon black or Shungite natural black. Shungite has the ability to clean water from almost of all organic compounds (including pesticides), metals, bacteria and harmful microorganisms. Water from Lake Onega in Russia, can be used for drinking without any prior cleaning! It is the result of thousands of years of interaction with shungite. The retreat is are 3 miles approximately outside Wrexham. Take the A525 off the A483 (Junction 4) Wrexham Road, head towards Coedpoeth. After 1.2 mile take a left into Rhoseberse Road (signposted Nant Mill) do not go up into the village as you may get lost, and then 0.8 mile 2nd left past Nant Mill into Hoel Penyfelin (their lane). Follow the single track down, until parallel with the white footbridge over the small river, with the Ford to your left, go straight ahead into the private drive, up to the first house Can-Yr-Afon. Park on the left by the garage. You have arrived at your destination. Park by Green Garage door (you have arrived at your destination). Song of the River Retreat Sanctuary is a spiritual and meditation retreat center, a place of uniquely profound energy vortexes and the perfect escape haven. Please note that a minimum 5 days' notice is required before booking.